Toddler meltdowns getting out of control? 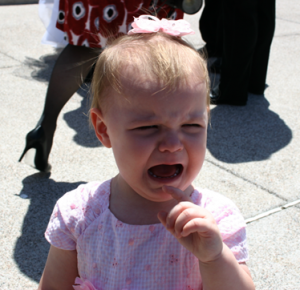 Are your toddler's tantrums getting out of control? Have you been on a date with your child recently? If not, then this could be part of the problem. With my own toddlers, I have found that their behavior is at its worst when they feel they are not being heard or when they are not a big enough part of my world. We remedy this by having a “mommy date day” or a “daddy date day” where we orchestrate a few hours to be one on one with that child. The “dates” don’t have to be elaborate…sometime it’s just spending an hour or two playing barbies or building train sets. But it is one on one time with that child doing something they requested to do with you. It is important to let them pick the activity (of course, you may have to gently guide them to low budget ideas!). For that time, they are the center of your world and they know it! That two hours of personal individual time spent provides a refill of a childs emotional cup that can last weeks! It can be equally rewarding for moms and dads as well. This is when you have the humbling epiphany of what a huge part of your child’s world you really are. It also allows you as the parent to reconnect with your child on their terms. They can talk with you without fear of being interrupted by their siblings or by a phone call or by any number of things that steal away our attention throughout the day. If you want to build that trust with your child and mutual respect that will last into their adulthood, it has to start with each of you making each other a priority. And there is not better time to do that than when they are still young enough to want it! I would warn you of making the “date” a reward for bad behavior. The trick is to make these “dates” a regular part of your monthly schedule with your children. Allow them to look forward to their “dates”. For this reason, it is also important to never cancel a scheduled date day…even if you have to shorten the time, don’t cancel it outright. These dates are promises to your child. When you have to say no to your little one’s pleas to come play because of any number of responsibilities that fall upon us on a daily basis, your scheduled date days can take the sting out of the disappointment for your little one because they will know that their individual time is coming and that Mom and Dad keep their promises! Try this out for a month and let us know how your experiment goes. If it is anything like ours has been, you will happily make these “date days” a regular part of your monthly routine for each of your kids.